In 2016 my beautiful 18-year-old son’s life was cut tragically short. He died in hospital due to a rare reaction to anti-psychotic medication. Oliver’s untimely death shows why the principles of Ask Listen Do are so important. From the moment Oliver was born, we knew that he was special and our love for him was overwhelming. Oliver was born premature and developed meningitis at three weeks of age. He was very ill and we were told they did not expect him to survive. However, Oliver began to recover. Everybody who came into contact with Oliver warmed to him and could not resist spending time with him. After a second episode of meningitis, amazingly against all odds and after many months of hospital treatment, Oliver’s strength and determination shone through and he survived once again – as always with that beautiful heart-warming smile that everybody was drawn to. Oliver was left with mild cerebral palsy, focal epilepsy and later on a diagnosis of mild autism. His disabilities did not hold him back, however, and as he grew up he went on to become an outstanding athlete, much loved by all who knew him. He amazed everyone with his achievements. But in 2016, Oliver was admitted to hospital because of seizure activity and his life was cut tragically short. He did not have a diagnosis of mental illness but had previously been given anti-psychotic medication to control his agitation in hospital, caused by his epilepsy and autism. These anti-psychotics had caused him to have an increased number of seizures, feel physically unwell and become very agitated. 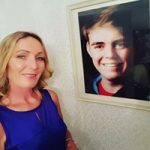 Oliver’s health deteriorated and he passed away a few weeks later due to a condition called neuroleptic malignant syndrome – a rare but serious side effect of antipsychotic medications. We believe that if staff had been trained in understanding autism and learning disabilities, impacted by seizure activity they would have managed the situation differently. DO everything in your power to prevent a story like Oliver’s from having to be told again. Paula McGowan grew up in Liverpool and is married to Tom McGowan who is a squadron leader in the Royal Air Force. Paula has recently moved to Australia with her husband but her campaigning continues to go from strength to strength. She attends health care conferences and has done several talks about what happened to Oliver. My beautiful son Nick also tragically died – the Coroner concluded gross neglect had contributed to his preventable death. Nick was only 27 years old. I fully support Paula with her campaign. If we can prevent any family from going through our heartache and trauma. This is Nick’s chilling Harrowing story https://www.bathchronicle.co.uk/news/bath-news/coroner-finds-gross-failures-southmead-548589 please read it Ask Listen Do and prevent this from happening ever again. Having a son with Learning Disabilities who sadly died last year in hospital when if proper care had been given would have survived, I absolutely stand by Paula and many other parents who are shocked about the lack of communication between Drs, Consultants to parents who will know their child inside out. You must listen, you must discuss care plan and you must take responsibility for your actions. Whilst applauding the “Ask, Listen, Do” initiative, these principles for practice should be standard for everyone involved in patient “care” in OUR=NHS.